The full-rigged ship Monkbarns is moved up to a buoy in the Thames in 1926 at the end of the last commercial voyage that she would make. 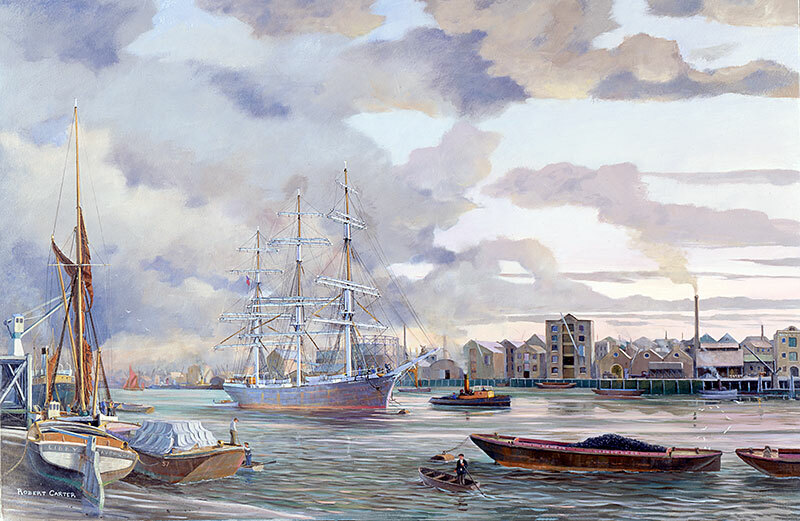 Seamen commonly dubbed the Thames “London’s River”. In Chapter 3 of my book Windjammers – The Final Story, a Monkbarns seaman, Dudley Turner, vividly described to me the last hours of this voyage. Monkbarns was built in 1895 for David Corsar & Co. and was sold to John Stewart & Co in 1911, under whose flag she remained until 1926. 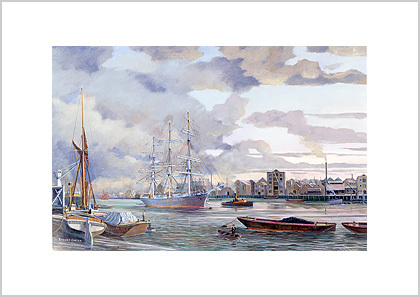 Monkbarns had been away on a nomadic voyage that saw her load coal in Newcastle, New South Wales three times for Chile and load guano or nitrates for the return trip. She led the tramping life of a typical lime-juicer* except she was embayed in floe-ice south of Cape Horn, which held her captive for three months. She must have sailed well to the south in order to get a good slant up to westward. to get around round Cape Horn. On 21 January 1926 Monkbarns left Callao for the UK with a full load of guano. After rounding Cape Horn her master, Captain Davies, became ill and the Mate took over command. He put into Rio de Janeiro and the Captain was taken to hospital, where he died on 21 March 1926. The Mate was given command for the last leg to London.